Most surviving examples of wallpaper from times long past are found in private collections and museums and if it weren’t for these carefully stowed prints, the history of wallpaper would have disintegrated along with the fragile paper itself. Though often used as a backdrop rather than a centerpiece wallpaper can have a significant effect on the mood and feel of a room. There were specific papers for bedrooms and specific papers for parlors each with their own unique taste. There are those who love the clean soft feel a papered room gives and there are those who find it a nuisance and detest wallpaper’s fickle nature. Historically, wallpaper in novels was used only by people who were false and flashy; perhaps because paper was used as a cheaper way to imitate expensive materials? Throughout history houses were build with the intension of lasting hundreds of years and were furnished with tapestries and chairs that would ideally last just as long. So when an ephemeral, replaceable material like wallpaper is introduced it clearly shows a change in attitude and fashion. A change that would eventually lead to our very own ‘throw away’ society where nothing is built to last. In 1851 during The Great Exhibition (Picture 1. – Picture 2.) 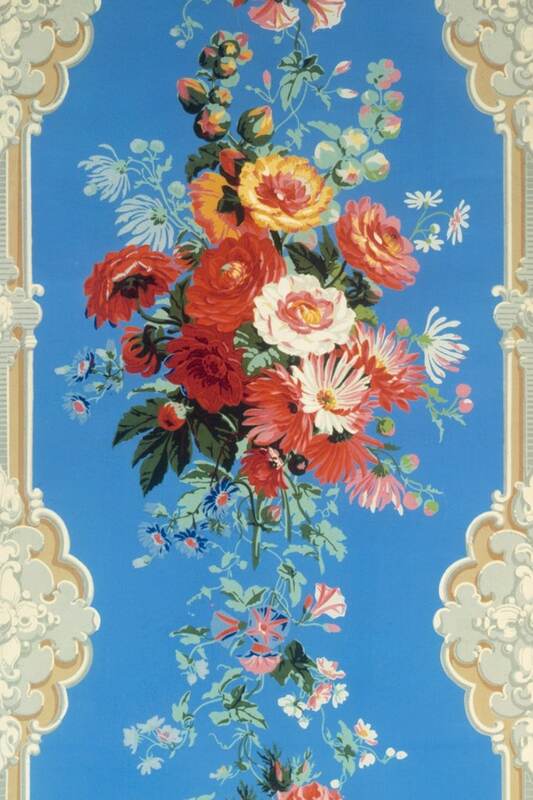 held at Crystal Palace, there were many wallpaper designs on show from countries all over the world. However critics were dismayed at the poor design quality of the papers and deemed them gaudy and in poor taste. Manufacturers had started using engraved rollers to print their paper and so could work with more intricate designs and use more colours which displayed their technical ability. However to critics perhaps it was a case of everything but the kitchen sink? Wallpaper was becoming more affordable to the public who seemed to like these new ‘gaudy’ designs, which inevitably caused them to become unpopular with the wealthier households. There were many patterns to choose from and new ones emerging every season. Wallpapers were produced illustrating public occasions, historic events, landscapes and trompe l’oeil which were seen as the more acceptable decorations for poorer homes due to their educational value. Wallpaper designer and architect A.W.N Pugin believed that only flat designs should adorn flat surfaces and anything with trompe l’oeil or shading was false and dishonest. He carried on making flat geometric papers, which were eventually used in the New Palace for Westminster. He spent his life trying to educate the public in good design. Alas…the public loved the ‘bad’ designs and these outsold all other wallpapers by miles! Then gradually the designers came round and began to accept the new modern ways of thinking. Next time I’ll be looking at Wim Crouwel and his obsession with geometry. . .